We will be setting up a load balancer with Heartbeat and Ldirector on CentOS 6. Ldirectord has been removed from RHEL 6 default repository and replaced with Piranha. As of RHEL 6.6, Red Hat provides support for HAProxy and keepalived in addition to the Piranha load balancing software. Piranha has been removed from RHEL 7 default repository and replaced with HAProxy and keepalived. 10.8.8.0/24 – LAN with access to the Internet. lvs-ldir03/lvs-ldir04 – real servers, both running a pre-configured Apache webserver. See the schema below for more information. Linux Director Daemon (ldirectord) is a background process computer program used to monitor and administer real servers in the Linux Virtual Server (LVS) cluster. Ldirectord monitors the health of the real servers by periodically requesting a known URL and checking that the response contains an expected string. While ldirectord is used to monitor and administer real servers in the LVS cluster, heartbeat is used as the fail-over monitor for the load balancers (ldirectord). The ldirectord installation steps must be repeated on both routers, the lvs-ldir01 and the lvs-ldir02. A fairly old (2010-03-21) heartbeat-ldirectord v2.1.4 package was available from epel5 repositories, but it’s been removed now. We are going to use an ldirectord v3.9.5 package which was released on 2013-07-26. Download it from http://rpm.pbone.net/index.php3/stat/4/idpl/23860919/dir/centos_6/com/ldirectord-3.9.5-3.1.x86_64.rpm.html or alternatively get it here (direct link) and install. The directives under “virtual=” have to start with a [TAB], not white space. The lbcheck.html file with the content of “found” must be present on the real webservers. See “man ldirectord” for configuration directives not covered here. 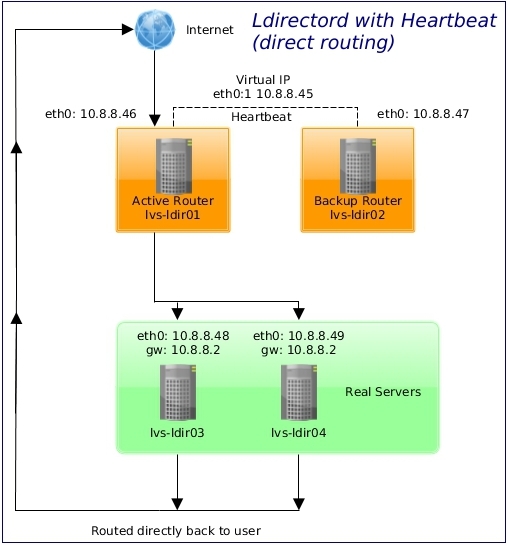 Heartbeat is a basic high-availability subsystem for Linux-HA. The heartbeat installation steps must be repeated on both routers, the lvs-ldir01 and the lvs-ldir02. # What machines are in the cluster. Use "uname -n"
lvs-ldir02.hl.local heartbeat: : info: mach_down takeover complete. lvs-ldir02.hl.local heartbeat: : info: Dead node lvs-ldir01.hl.local gave up resources. lvs-ldir02.hl.local heartbeat: : info: Link lvs-ldir01.hl.local:eth0 dead. Now, if we start the heartbeat service on the lvs-ldir01 node, resources will be transferred from the lvs-ldir02 back to the lvs-ldir01 due to “auto_failback on”. Check logs /var/log/ha.log and /var/log/ldirectord.log. This entry was posted in High Availability, Linux and tagged CentOS, heartbeat, ipvsadm, ldirectord, LPIC-3. Bookmark the permalink. If you notice any errors, please contact us. At least in my case I added this step.